Brought live to the stage as a family musical, based on the smash-hit animated film, Shrek: The Musical tells the not-so-classic fairytale story of Shrek, a lone ogre who lives in a swamp and how he comes to take on a quest to battle a fire-breathing dragon to save the beautiful princess who lives in the highest room in the tallest tower. By his side is his "noble steed" – a talking Donkey. 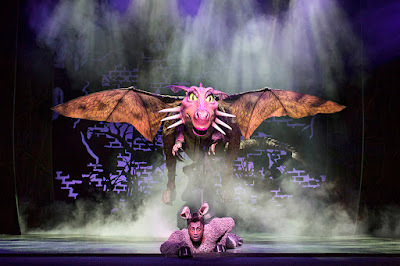 Wonderfully light-hearted and quick-witted, Shrek The Musical is a delightful family treat for the whole family. A Broadway recording of this show is available on DVD Starring Brian D'Arcy James and Sutton Foster, and it's safe to say I could recite along with every word. I loved that production and so was very excited to see what this UK tour brought to the stage. Lots of things have been changed for a British audience which is understandable, however there were cuts and changes made which I simply couldn't understand. For Example, "I Know It’s Today" is a beautiful trio sung by 3 versions of Princess Fiona as she grows up over time. 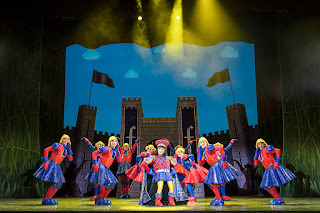 In this production, we had Laura Main's Princess, accompanied by puppets which she has supposedly made during her 8,423 days stuck in her tower. It just didn't work. The beauty of the song was lost and what was supposed to be funny fell flat. This was a reoccurring theme throughout the evening unfortunately. Leading this show as the lovable green "monster" is Steffan Harri. His tenor tones were stunning and he sung the role with total ease. His portrayal of Shrek was suitable under-stated; he's the biggest character in the show so his personality works when the actor restrains which Harri did perfectly. Similarly, when the time called for larger-than-life moments, he delivered. "Who I'd Be" was stunning, as was "When Words Fail" – both beautifully poignant and gentle. The previously mentioned Laura Main was good but it took her 2 hours to really warm into the role. By the end of Act 2, she held the audience in her hands and owned the stage but earlier in the show, we struggled to warm to her and her singing was lacklustre however, by the finale, I was whopping and hollering for her. Marcus Ayton is the sassiest Donkey I've ever seen. Channelling so much attitude and vivacity, he was a favourite amongst the children of the audience and that was clear to see. 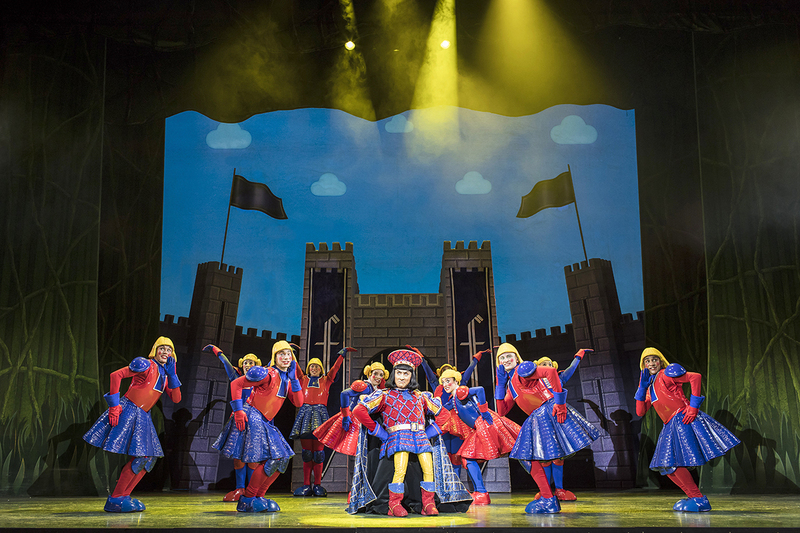 The show stealer for this production is undoubtedly Samuel Holmes as Lord Farquaad. Having previously seen him host a cabaret evening at The Other Palace, I had experienced a wonderful taste of his own personal humour; fearless, unashamed and downright hilarious. All of this shined through in a remarkably unique portrayal of the 3ft tall mini-villain of the show. His ability to ad-lib and guide the audience through their reactions, despite being the "baddie" was astonishing. I only wish he could have been in every scene – he was my absolute favourite thing about this production by a country mile. The ensemble in this piece are all excellent but Lucinda Shaw as the vocalist for the Dragon was other-worldly. The puppetry for this mega-giant was exceptionally good but forget the wings, it was Shaw's vocals that made the Dragon fly. What a voice! I was so looking forward to "Donkey Pot Pie" as one can hear on the aforementioned Broadway Cast Recording or DVD, but "Forever" was a fantastic alternative for a British audience and it was one of the best songs of the evening. touches like the 3 little pigs each carrying a briefcase – one looked like twigs, the other like straw and the next like bricks, all added to the fairytale magic of this piece. The make-up, particularly the prosthetics used for Shrek were stunning. As realistic as a giant green ogre could ever hope to be! For a relatively small band, the sound was wonderfully rounded and balance was spot on. All in all, this is not just a family show – I think anybody of any age would enjoy it, after all, we all love a good fart joke. Shrek is a story of acceptance, defying expectation (and gravity in Lord Farquaad's case during "What's Up, Duloc?") and true love. What’s not to enjoy about that? 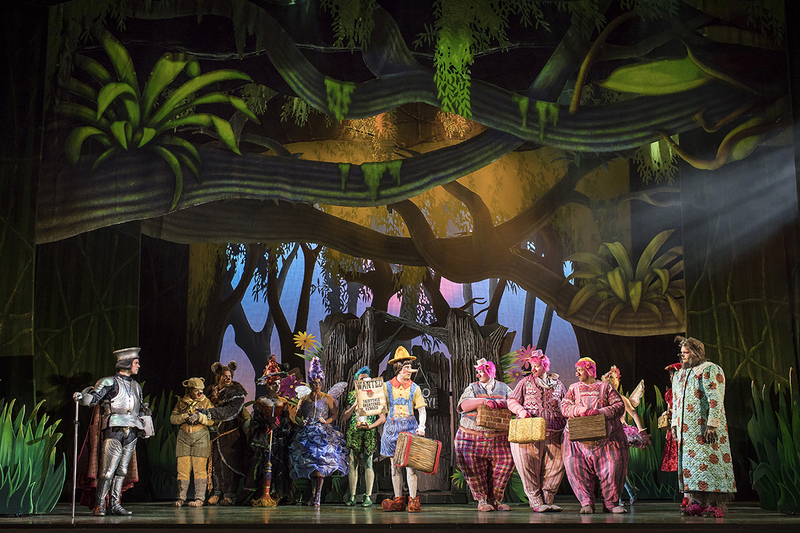 A big, bright, beautiful production.